Wahama junior Maddy VanMatre throws to first base, during the Lady Falcons’ 8-0 victory on Thursday in Hartford, W.Va.
HARTFORD, W.Va. — The Lady Falcons waited until their backs were against the wall to play their best. 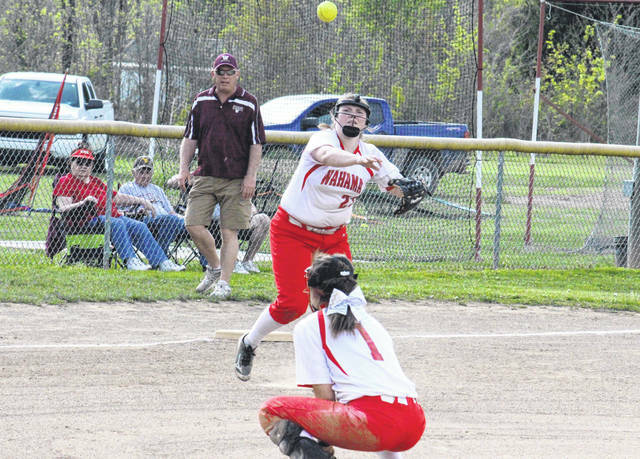 The top-seeded Wahama softball team won Thursday’s Class A Region IV, Section 1 elimination game in impressive fashion on its home field, defeating No. 2 seed Williamstown by an 8-0 final. 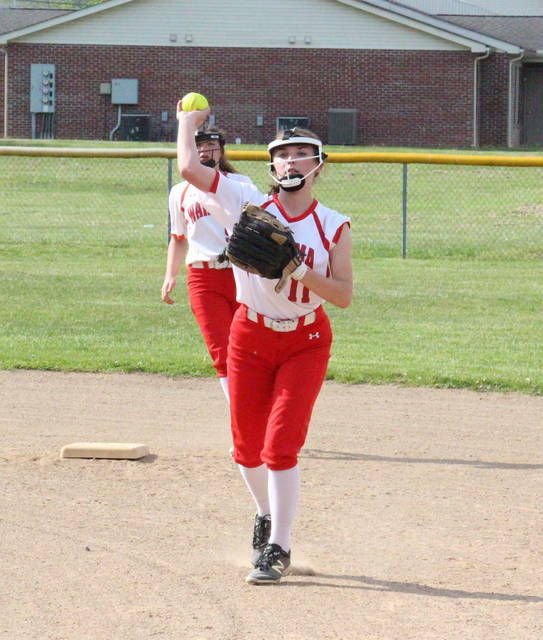 Wahama (17-11) — which didn’t commit an error the contest, while holding Williamstown (12-13) to just one hit — broke the scoreless tie in the bottom of the first as Maddy VanMatre doubled home Emma Gibbs. The very next batter, Ashtyn Russell, doubled home Maddy VanMatre and then scored on a single by Victoria VanMatre. The Lady Falcons extended their lead to 7-0 with a two-out rally in the bottom of the second inning. Emily VanMatre drove in Hannah Rose, and then Maddy VanMatre blasted a three-run home run. 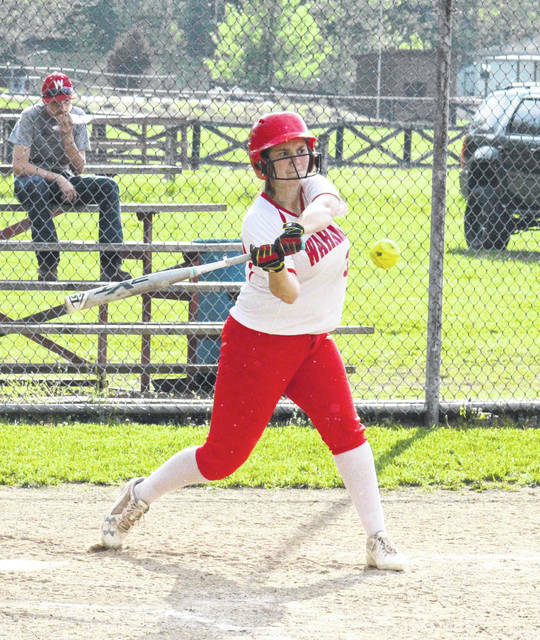 After leaving the bases loaded in the bottom of the third and having a runner thrown out at third base in the fourth inning, Wahama wrapped up the 8-0 mercy rule victory in the bottom of the fifth, when Victoria VanMatre hit a lead-off home run. Rose was the winning pitcher of record in a complete game for the Lady Falcons, striking out four batters, walking one, and hitting one, while allowing one hit. Gracie Graham suffered the pitching loss in two innings for the Lady YellowJackets, allowing seven earned runs on seven hits and two walks. Leading the Lady Falcons a the plate, Maddy VanMatre was 2-for-4 with a home run, a double, two runs scored and four runs batted in. Victoria VanMatre was 2-for-2 with a home run, a run scored and two RBIs, Gibbs singled twice and scored twice, while Rose singled twice and scored once. Russell doubled once, scored once and drove in a run for the hosts, while Emily VanMatre recorded a single, a run and an RBI. Kayla Scott had Williamstown’s only hit, a single in the second inning. 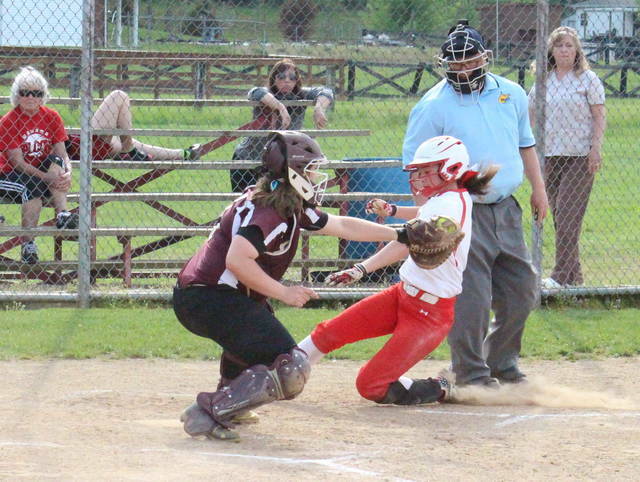 The Lady YellowJackets were responsible for the game’s only error. Wahama left four runners on base, one more than the guests. Williamstown’s season is bookended by losses to Wahama, as the Lady Falcons also won the season opener over the Maroon and Gold, by a 9-5 count in Wood County. The Lady Falcons are back in Hartford in an elimination game on Friday, as they host fifth-seeded Calhoun County.